FREEDOM’S FINEST OUTDOORS WILL BE TAKING VETERANS ON SPRING TURKEY HUNT. IF YOU ARE A VETERAN AND INTERESTED IN A LOCAL (MICHIGAN) SPRING TURKEY HUNT PLEASE FILL OUT THE FORM UNDER THE “I AM A VETERAN” SECTION ON THIS WEBSITE. IF YOU ARE A VETERAN AND INTERESTED IN PARTICIPATING IN A FISHING CHARTER THIS SUMMER PLEASE FILL OUT A FORM UNDER THE “I AM A VETERAN” TAB ON THIS WEBSITE. IF YOU ARE A FISHING CHARTER AND ARE INTERESTED IN TAKING SOME VETERANS OUT ON A CHARTER PLEASE FILL OUT A FORM UNDER THE “VOLUNTEER” TAB ON THIS WEBSITE. FREEDOM’S FINEST OUTDOORS IS TAKING 4 VETERANS OUT ON A MISSOURI SNOW GOOSE HUNT! Freedom’s Finest Outdoors has teamed up with our good buddies over at Whitecap Charters to take a group of 6 veterans out on a half day fishing trip! Be sure to check WhiteCap Charters out! FFO has donated a 4 hour Fishing charter for the 30 veterans who are partaking in a weekend retreat that is put on by the great organization Reuniting After War! We are so excited to be able to give this opportunity to to the veterans during their retreat and to work with such an amazing organization! Please Check out all the amazing stuff Reuniting After War is doing for our veterans! We are taking a total of 5 veterans on local spring turkey hunts throughout the the month of may! Our very own Vice President and founder of Freedom's Finest Outdoors will be participating in the 2018 Bataan Memorial Death March. This will be his second time participating in this memorial event. This is a 26.2 mile hike that takes place in White Sands Missile Range in New Mexico. Here is a link that tells the history of the Bataan Death March. FFO is taking three veterans on a hog hunt in Florida! Freedom's Finest Outdoors is taking 4 veterans on a guided snow goose hunt in Missouri. 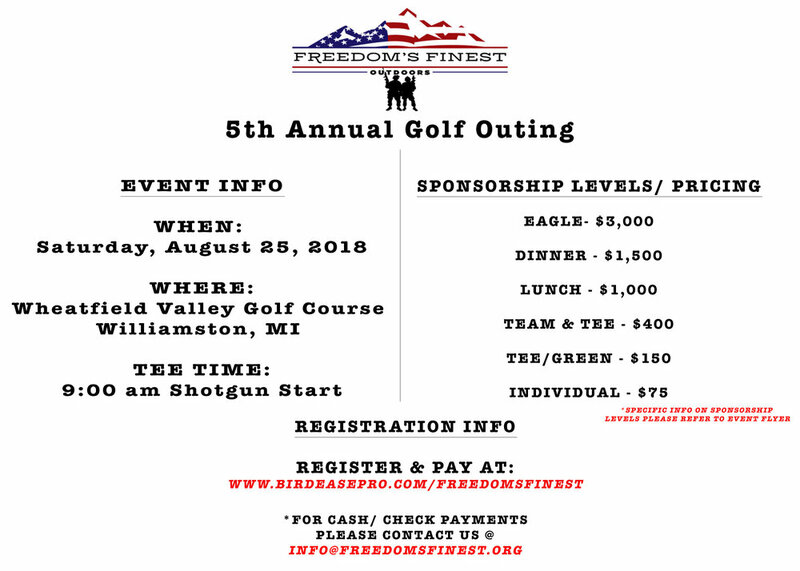 Freedom's Finest Outdoors is sending a team of veterans to participate in a state wide coyote tournament! Be sure to check out our social media pages for updates and pictures on how the team is doing. Wish them luck!